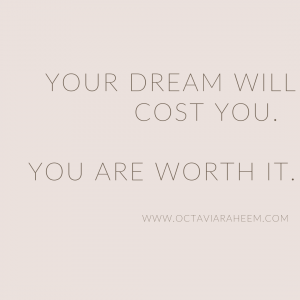 Your dream will cost you. You are worth it. I paid attention. I realized how much work the work would take. Was this my work? Could I do this work? What did that really mean? What would that require of me? 11 or so years ago, these were the questions I asked myself. I didn’t dream of being a yoga teacher. I dreamed of music that me and my sister Ebony spent countless hours fighting over when deciding what to listen to: Lauryn Hill, Outkast, Sade… I dreamed in mama’s Saturday night records- Chaka Khan, Patti Labelle, and Aretha. I dreamed in the Gospel: God Specializes. Lashun Pace’s, I know I been changed. I dreamed the way my childhood smelled: Whiffs of cocoa butter, mama’s hot comb, and Ora Faith’s fried apple pie. Gainesville, Georgia. Wet red clay. Hints of incense bought at the corner store-sacred. I dreamed the sound of laughter that I’d sipped and guzzled around a table of sisters in Accra, Ghana. I dreamed the way sweat fell on those Boston living room floors, at that house party me, Ibi, Avril, and Karima had in 2003. I dreamed in the texture of tears Alesha, Noro and I shed at Ki’s funeral in that small chapel on the southside of Chicago. I dreamed of a place that held the healing tones that me, Tiffany, and Jami shared at our Sunday Soul Suppers in a little ranch house in the Arizona desert. I dreamed the feeling of being held, fed, and loved in the midst of it all. I dreamed of holding. Feeding. Loving. I dreamed circles made of Starshine & Clay. A place that gathered all of what makes me whole-my pieces- and affirmed it. My practice revealed dimensions of bonds, locks, and chains. My practice also showed me how discipline, alignment, and awareness were essential keys. And so, I dreamed of being free. And I knew, because I’d sat at the feet of masterful teachers and paid attention, that it would cost me. And it did. It cost me my addiction to grasping, lack, and limiting beliefs. It cost me comfortable, yet tired relationships and the capacity to maintain fake friends for status and social “mobility”. It cost me dinners out and many lazy nights in. It required me to pay in thousands of hours of teaching, studying, and learning totaling years and years BEFORE I left my day job. It cost me the familiarity of a time clock and the ability to delay responses like I did when I didn’t work for myself. I paid with misunderstandings and silent tears in rooms, as the only one. It has afforded me a sense of deep trust that it’s my birth rite and responsibility to create and design a life that reflects the prayers of my mama and grandmama ‘nem. It has netted me the capacity to discern the taste of an organic relationship in the making vs. a modified one long before I fill my plate with someone else’s stuff. It has granted me a level of integrity in my response and communication (time) with others that honor our potential or real life relationship. It has repaid me in understanding, smiles of soul recognition, and cries of release with yogis like and unlike me all over Atlanta, Georgia, and the southeast. Here I am free-er to be myself- to live, love, mother, create, and work on terms that my great great grandmama might not have been able to imagine. Yes. It has cost me more than I have space to write here. Yet I owe no one more than I owe the girl I was, the woman I am, and the woman I am destined to be. Your why is your light. Who’s not in the yoga room? © Copyright Octavia Raheem 2013–2015. All Rights Reserved. Sign-up to be the first to know about new retreats, trainings and classes.